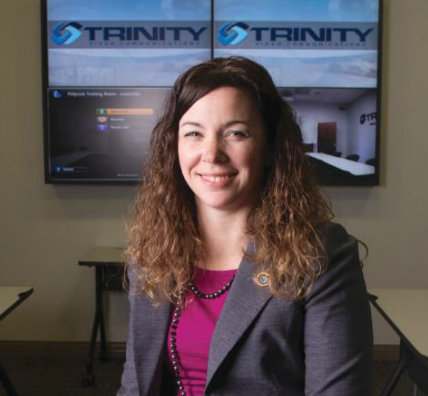 Commercial Integrator Magazine has named to this year’s class of 40 and Un der Industry Influencers Julie Kolb, Assistant VP of Administration and Chief Security Officer at Trinity Video Communications. Mrs. Kolb joined Trinity Video in 1999. “Julie has been with our company for quite some time, almost 17 years, and is definitely an integral part of our past and future business success,” said Trinity Video CEO Barry Sawayer. “She’s a valuable member of our Executive team, and is a person who carries a lot of respect in the industry. We’re very lucky to have her at Trinity,” said Sawayer. Click here to view a complete list of this year’s Class of 40 and Under Influencers. Trinity Video Communications provides state-of-the-art audiovisual and video communications solutions to large corporations and healthcare organizations to transform the way they communicate and collaborate. Trinity Video also provides real-time unified communications to government agencies including the Department of Justice, Department of Defense, and law enforcement agencies at the federal, state and local levels responsible for mission critical initiatives. The company specializes in custom room design and systems integration for executive conference rooms, huddle rooms, classrooms, and command and control centers, as well as unified communications, telemedicine solutions, Bring Your Own Device (BYOD) videoconferencing, digital signage, video walls, and streaming video.